Passwords Base is a reliable password and account manager that lets you safely store all your account passwords and other credentials, and access them in a single place. 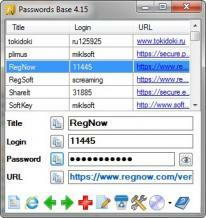 The application lets you copy information such as usernames and passwords to the clipboard with a single mouse click. The customizable interface can be set to hide or show certain elements, and the even history lets you undo changes. Furthermore, Passwords Base provides several functions accessible via the system tray. In the interface, you can hide columns you’re not interested to see in the main grid, as well as shrink the window size.